We survived our first self-drive trip in Japan! So we hope to share with you what we have learnt from this self-drive trip! Remember to bring along your passport, Singapore driving license and international driving permit (IDP) in order to rent a car in Japan! To apply for IDP, just bring along your NRIC and Singapore driving license to Automobile Association of Singapore. The IDP costs SGD20 (correct as of May 2016). Alternatively, you may apply online. We applied our IDP at Automobile Association of Singapore. The staff asked us to fill up our particulars on the iPad, then took our photo on the spot. It took us about 15 minutes to receive our IDP! Driving in Japan is easy for Singapore drivers, since right-hand drive system is practised in both countries. One difference is that the "STOP" sign is in Japanese "止まれ". Another difference is that in Singapore, the traffic lights are located both before and after the pedestrian crossing or the junction, while in Japan, the traffic light is located after the pedestrian crossing or the junction, so we had to remember not to stop right next to the traffic light! In Singapore, we key in the 6-digit postal code into GPS to get to our destination. 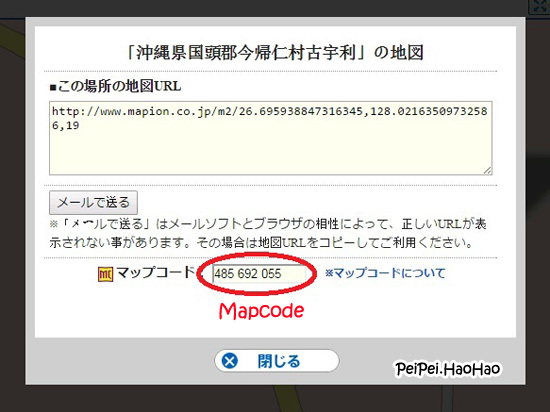 In Japan, we can use either telephone number or Mapcode. Mapcode is a navigation system that is location-specific. Why do we need Mapcode? Why can't we just stick to telephone number? Well, imagine that you are going to a cape, there is no telephone number! In fact, I spent quite some time to do some homework before we set off to Okinawa, because I had to compile a list of Mapcode of the places that we were driving to. So the next question is, how do we find the Mapcode? 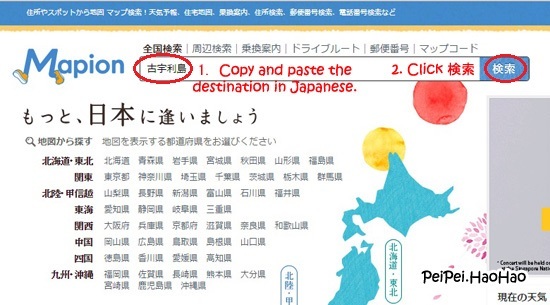 Enter the Japanese name of the destination or the address in Japanese. If you only know the English name, search online for the official website or other websites, then copy and paste the Japanese name or address. Click 検索. When there is more than one search result, choose the correct destination by checking the telephone number / address / location on the map on the right. Click the green icon 地図. Do take down the telephone number just in case the Mapcode does not work on the GPS. Click "便利ツール" on the top right hand corner, then on the drop-down menu, click the last item "地図 URL". Here it is, the Mapcode of your destination! My practice is to compile the list consisting of the name of the place, Mapcode, and telephone number (if any), and I printed 2 hard copies to bring along, and saved 1 soft copy on Google Drive. We used Mapcode most of the time during our Okinawa trip, and the Mapcode is really accurate! It is based on Google Maps. Just type in the place, then the Mapcode would appear at the bottom the page! So easy! We got English-language GPS from OTS Rent-a-Car. The type of GPS used by other car rental companies may be different, but they are generally similar in terms of operation. Here is our step-by-step guide on how to use GPS in Japanese rental car. Click "Search by Phone Number"
Or click "down" and "Search by MAPCODE". Key in telephone number or Mapcode, and click "Done". Verify the destination marked by +, you can check by looking at the location on the map, or you can check the address if you understand Japanese. Then click "Go here now". At the bottom left corner, you will see information on the distance, toll fee (if any) and time taken to reach the destination. Click "Start Navigation". One thing I like about this GPS is that it is naggy! It reminds us to turn left or right 3 times before we make a turn. It alerts us once at about 700 m away, reminds us at about 300 m away, and when we are within 100 m to the turn, it would remind us "Shortly after, turn left / right". Only a blur driver like me would still miss a turn and drive an extra mile! If you feel that our ERP is expensive, you would be shocked to see the toll fee in Japan! We spent 900+ yen (~SGD12) to get from the north to the south of Okinawa which is about 53 km! And it is considered as "cheap" in Japan! Choose 有料回避 to avoid toll fee. We tried that once, we saved some money, but it took more time to reach our destination, because we drove at 50 km per hour (yes, that's the speed limit at Okinawa) and had to stop at many many traffic lights. So you have to consider the time taken and the amount of money saved. If you can understand Japanese, you can use Drive Plaza or Navitime to calculate the toll fee. In Singapore, we have ERP and we pay by cash card inserted into in-vehicle unit. In Japan, they use ETC which is similar to our cash card. We didn't rent ETC during our trip as we decided to use the expressway only once. So instead of driving through the ETC lane, we had to drive through the general lane "一般". At the toll gate that we entered the expressway, we took a ticket from the machine. Then at the toll gate that we exited the expressway, we passed the ticket and paid cash to the staff. If you are using expressway frequently, then you may consider getting expressway pass from the car rental company. Have you tried self-driving in Japan before? Do share with us your tips! Hi thanks for the very informative post! May I know if it's ok to drive slightly above 50km/h if traffic is good? Will we get fined?! We would suggest that you drive within speed limit for the safety of yourself and other road users. Very very informative! I'll be driving in Okinawa as well and I believe the information will help me a lot in preventing last minute problems. Glad that the information is useful. Enjoy your trip!